IMPORTANT: It is critical to identify the species and know the habits of destructive termites in a local region in order to formulate an appropriate control program. The species that cause severe structural timber damage to homes in Alabama are (1) the Eastern subterranean termite and (2) the Formosan subterranean termite. CONTENTS: learn about these termites; the area of their distribution in Alabama; the timber damage they cause; their destructive nature and capabilities; the life cycle of each species; the fascinating life of a queen termite and her king permanently by her side; the armoured termite soldiers and the colony's tireless workers that can travel long distances and through tight minute crevices and gaps to get at a timber food source; identify the swarming "reproductive" termites; and receive professional tips on how best protect your home from the world's most efficient timber recycler .... subterranean termites. DISTRIBUTION IN THE USA: The Eastern subterranean termite is the most common and widely distributed termite in the USA. It is commonly found throughout Alabama, and causes severe economic loss in densely populated areas. AREAS OF HIGH RISK IN ALABAMA include Alabaster, Albertville, Alexander, Anniston, Athens, Auburn, Bessemer, Birmingham, Cullman, Daphne, Decatur, Dothan, Enterprise, Eufaula, Fairfield, Fairhope, Florence, Fort Payne, Gadsden, Gardendale, Hartselle, Helena, Homewood, Hoover Hueytown, Huntsville, Jasper, Leeds, Madison, Millbrook, Mobile, Montgomery, Mountain Brook, Muscle Shoals, Northport, Opelika, Oxford, Ozark, Pelham, Pell, Phenix, Pleasant Grove, Prattville, Prichard, Saraland, Scottsboro, Selma, Sylacauga, Talladega, Troy, Trussville, Tuscaloosa, Tuskegee and Vestavia Hills. Eastern subterranean termites are highly destructive to douglas fir and other common building timbers widely used in the construction of homes in Alabama. In large numbers, the subterranean worker termite will rapidly devour the internal spring wood sections; preferring to leave the harder summer wood sections. As a result, infested timbers are often left as a thin external shell, with layered "honey-comb" hollow sections (as illustrated) packed with moist soil. Eastern subterranean termites thrive in a moist dark environment. Moisture and humidity control are essential for their survival. The Eastern subterranean termite is a serious economic timber pest causing millions of dollars of damage throughout Alabama. It is estimated that more than 1 in 5 homes in the urban areas of most Alabama cities have been or will be attacked at sometime by these voracious little insects. Eastern subterranean termites are a highly social insect centred around a primary breeding nest. The colony consists of several general castes, each with a different role to perform, and interdependent upon each other for their survival... the queen, king, the winged reproductives (young kings and queens), soldiers and the destructive workers. 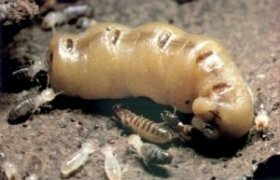 THE QUEEN TERMITE is an egg laying machine, her body is enormous compared to her off-spring and she can live more than 25 years and produce more than 2,000 eggs a day. THE KING and queen live in a central chamber and are feed and attended to by the worker termites. the one that does all the damage. They carry out all work in the nest, including gathering food (timber and other cellulose), constructing tunnels, repairing and enlarging the colony nest, grooming and feeding the soldiers, the king, queen and young nymphs in the nursery. 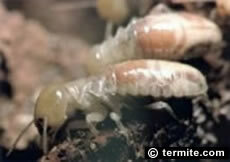 IDENTIFICATION: Eastern subterranean worker termites are small in size, about half the size of match-head or 1/8" long. They are a creamy translucent colour, soft bodied, have no wings, are sterile, blind and work 24 hours a day for their entire adult life-span. SOLDIER termites are the defenders of the colony, particularly against marauding ants - with whom they have been at war for more than 250 million years. IDENTIFICATION: the soldier termite has an orange coloured, rectangular armoured head, with mandibulate pinchers which they use to crush the ants. On their forehead is a fontanelle (frontal gland hole) used to squirt a sticky latex to ensnare the ants. The soldier's mandible pincers are curved at about 70 to 90 degrees. The body of the Eastern subterranean termite is flat, with the width of approx 1/32”. CONSUMER NOTE: If you open termite infested timbers or their mud tunnels or shelter tubes, it is the soldier termites that rush out to guard the area whilst the workers repair the breach. The identification of these insects as "termites" means an immediate professional inspection and protective measures are essential to avoid further ongoing or extensive damage. Remember: the standard home insurance policy in Alabama, does NOT cover the costs of repairs or replacement of termite infested timbers in a home. SWARMERS or REPRODUCTIVE termites - scientifically called "alates" are commonly seen by homeowners in Alabama, when they swarm in large numbers, generally in the spring, during daylight. They have eyes, are poor fliers but can be swept hundreds of yards, by the wind. When they land, they drop their wings, find a mate to become king and queen of a new termite colony. IDENTIFICATION: Eastern subteranean termite "swarmers" are about 3/8" in length, including wings. They have a dark brown body and a small fontanelle (frontal opening) on it's head. Their wings are a brownish grey, with two dark solid veins along the forefront of the front wings, which are distinctly larger than hind wings. WHEN DO THEY SWARM? In the northern part of their range, swarming takes place in the spring, but without rain. In the southern areas, swarming usually follows rain. Occasionally, a few smaller swarms may occur during the summer. Swarming most often occurs during the morning following a warm rain shower whereby the soil temperature is around 70°F. The swarmers are emitted in their thousands when a mature termite nest is large and well established. CONSUMER NOTE: If you find swarmer termites in or around your home, it is a sure sign a large nest is close by and that your home is at high risk of a termite infestation. Colony nest development is slow in the first few months, with the egg-laying capacity of the new queen termite peaking after a few years, producing up to 10,000 offspring a year. The queen may live for many years and workers up to two years. Eastern subterranean termites need to maintain a high level of humidity and temperature (75 to 95°F) in their central colony nest. 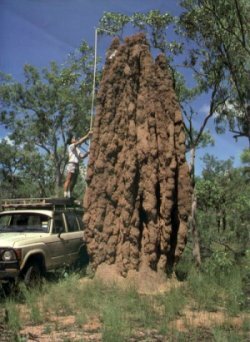 This picture shows a large above ground termite nest found in the Northern Territory of Australia. In the USA, most of the destructive subterranean termite species build their nest completely below ground level. A large Eastern subterranean colony in an urban environment in Alabama is most often unseen, until a serious problem is encountered. Modern termite control methods include termite baiting systems; the installation of a treated soil barrier or eradication zone around the base of a building; and a range of cultural and home maintenance measures to make your home less susceptible to subterranean termite infestation. AREA OF DISTRIBUTION: The highly destructive Formosan subterranean termite, (Coptotermes formanosus) is native to China, but has become entrenched in southern parts of USA including Alabama. Formosan subterranean termites are a serious timber pest in and around the coastal regions of Alabama, Louisiana, Mississippi, Texas, Tennessee, Georgia, South Carolina, southern California, and Hawaii as well as, some inland towns and cities in these states. DESTRUCTIVE NATURE: Formosan subterranean termites are the most aggressive and destructive timber pest in the United States. They are known to cause major structural timber damage to homes and buildings within a few months. A Formosan termite colony may develop to several million termites, foraging or consuming timber food sources with a 400 feet radius from the colony nest. Principal food sources include buildings, trees, landscaping timbers, poles and other timber structures, including ships and barges. Infestation can occur to living trees, such as oak, cypress, pine and maple. Formosan subterranean termites often cause power failures by chewing through electrical cabling. Indeed a highly destructive voracious timber pest. IDENTIFICATION OF TIMBER DAMAGE: Formosan termites eat mainly the spring wood of susceptible timbers, most often leaving the summer wood sections. Timbers infested by Formosan termites usually have layered sections packed with moist soil, particularly in high activity areas. BIOLOGY & HABITS - FORMOSAN TERMITES: Formosan subterranean termites have a closely related life cycle, biological profile and habits as Eastern subterranean termites. They typically live in the ground with a queen termite, a king, soldiers and worker termites. A large mature nest will periodically emit swarmers in large numbers over a wide area to find a mate from another colony nest to start up a new colony. WHEN DO THEY SWARM? Formosan subterranean termites swarm in huge numbers in late spring or summer; usually following a warm rainy day. They prefer to swarm in times of high humidity in the evening hours from dusk to midnight. IDENTIFICATION OF SWARMERS: The swarmers are attracted to lights and are about 1/25'', including wings. Their body color is pale yellowish brown. A fontanelle (frontal gland pore) is present. The swarmers have four wings of equal size with dark hard veins in the front portion of the front wing. The wings are a translucent, slightly milky color and covered with tiny hairs. Both the Eastern and Formosan subterranean soldier termite have a small hole on their forehead, from which they may emit a white sticky latex to ensnare their enemies, primarily ants. Formosan subterranean termites typically construct mud galleries or "shelter tubes" across hard objects in order to gain access to timber food sources. They are known to enter buildings through cracks in concrete flooring or to travel under parquetry or tile flooring through gaps of less than 1/16" wide. 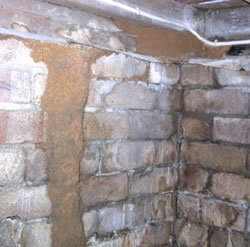 The space between the foundation and the first mortar joint is often enough space for termites to enter a home. Formosan subterranean termites can establish secondary colonies in moist wood in wall cavities and even roof voids in upper stories of high rise buildings and do not need soil contact if there is a nearly constant moisture source, such as, from faulty plumbing, shower recess or broken roof tiles. Due to it's size and aggressive foraging behaviour, a colony of Formosan subterranean termites can cause more damage than any other termite in the United States ... a large infestation can destroy the structural timbers in a home within several months.